For three of four quarters, the offense was stone cold. The team’s third-leading scorer played hardly a quarter, hampered by foul trouble. Its star guard entering the year was now playing off the bench in an effort to cure her shooting slump. And yet Tech notched its second ranked win of the year, beating No. 12 Syracuse to move to 3-3 in conference play and 13-6 on the season. It was the sort of ugly triumph that a team hoping to contend for a spot in the NCAA Tournament must achieve every once in a while. The 65-55 score betrayed the competitiveness of the game; that 10-point margin, achieved largely as Syracuse intentionally fouled Tech players and the Jackets — particularly Kierra Fletcher, whose performance will be discussed in further depth later — capitalized. In a conference where a pair of McDonald’s All-Americans along with a Class of 2017 five-star recruit and a former ACC Rookie of the Year still leave the Jackets outgunned by a number of teams, beating the Orange is both a major resume-builder and a phenomenon worth dissecting. Here are some takeaways. We had seen Lotta-Maj Lahtinen play in a reserve role for much of her freshman year, and when MaChelle Joseph decided that Francesca Pan needed to play off the bench, at least temporarily, Lahtinen got the nod to replace her in the starting lineup. The Finnish freshman did not light up the box score — she finished the game making only one of her seven attempts from the field. Two points from a member of the starting lineup is rarely a winning formula, particularly with scoring threat Elizabeth Dixon riding the pine for much of the afternoon due to fouls she accumulated early in the game. But what Lahtinen lacks in offensive skill early in her career, she makes up for in intensity. Lahtinen put together a scrappy performance on both sides of the floor. Her defense is one of the reasons that Syracuse star and projected WNBA draft pick Tiana Mangakahia was held to 5 points on 17 percent shooting, just one year after Mangakahia set her career high for points against the Jackets. And her three offensive rebounds, tied for the team lead with Lorela Cubaj, helped generate additional possessions for Tech, even when the Jackets were shooting with poor efficiency. Lahtinen’s stint in the starting lineup may just be a short-term move by Coach Joseph, but she demonstrated on Sunday why Joseph trusted her with that opportunity. And given that Pan shot a much-improved four of nine from the field, it seems as though Joseph’s strategy might be working. Kierra Fletcher was in the midst of an excellent sophomore campaign entering the game. She led all backcourt players on the team in rebounds, led the team in assists and placed second in steals. She took that performance to another level on Sunday — her 22 points were her most since she put up 25 in a season-opening double overtime loss to Houston, and Fletcher accomplished the feat while being the only player for either team to play all 40 minutes. Fletcher fell just one rebound short of a double-double, but the most impressive aspect of her performance was her consistency from the free-throw line. 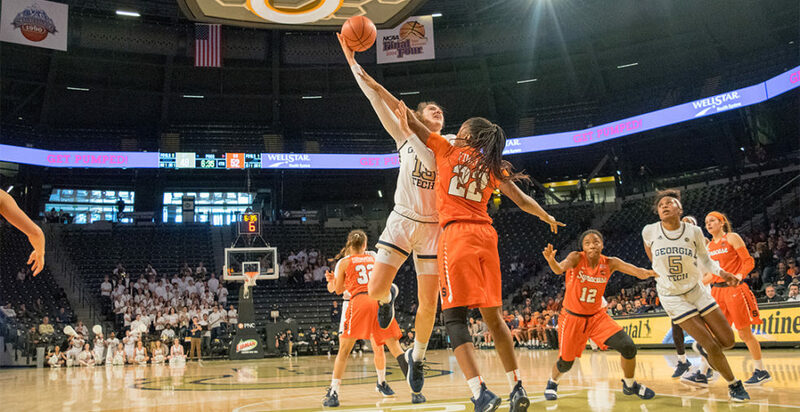 Fletcher made 10 of 11 attempts from the charity stripe, enabling the Jackets to put the game away in the final minute as the Orange fouled in desperation. Joseph knew she was signing a pair of McDonald’s All-Americans in Elizabeth Dixon and Elizabeth Balogun. What she could not have possibly known was how soon the returns would come. Balogun has been ACC Rookie of the Week four times in the past six weeks, and Dixon has added on a pair of Rookie of the Week accolades as well. Balogun was the one to come up big against Syracuse: she hit four of seven shots from three and finished over 50 percent from the field, recording 20 points on the night. Balogun’s presence was helpful to more than just her score total — the Jackets outscored the Orange by 23 points when she was on the floor, indicating that her defense and overall cohesion with the starting lineup were likely impactful. An athletic block late in the game showed the sort of impact Balogun can make on defense, particularly as she matures. When the game was over, Joseph ran to the middle of the court with her players as they all hugged in excitement, walking away with perhaps their biggest win of the season. Tech’s coach is not usually reserved, but it was an uncharacteristically jubilant display. And for good reasons; this was a win worth celebrating, one that showed that Tech could do damage in the NCAA Tournament if given the chance to participate. The Jackets will look to capture similar magic against NC State on Sunday at McCamish Pavilion.